This species is accepted, and its native range is Mexico to Tropical America, W. & W. Central Tropical Africa. Pendulous fruits, resembling a small mango. Tree 7.5–10(–30) m. tall, with a somewhat columnar or pyramidal crown in Africa (often more spreading in America); bark fairly smooth, grey. Branchlets with small reddish-brown mostly spreading hairs at the tips, soon glabrescent, covered with small closely arranged lenticels. Leaves 20–40 cm. long; stipules linear, 6–10 mm. long, caducous; stipels subulate, 1–5 mm. 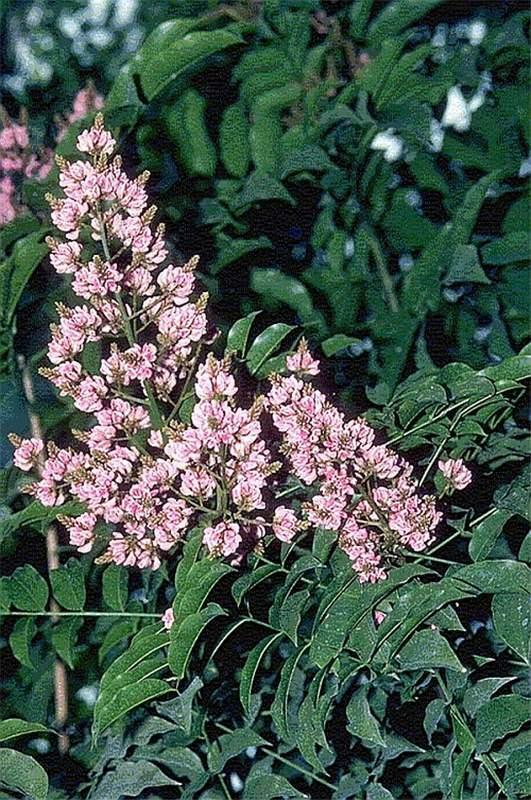 long; leaflets in 4–8 pairs, oblong-lanceolate or rather narrowly oblong to elliptic-oblong, 5–11(–17) cm. long, 2–5(–6) cm. wide, bluntly pointed to shortly acuminate, cuneate or shortly rounded at the base, soon glabrescent except sometimes for small hairs along the midrib beneath; midrib immersed above, very prominent beneath; lateral nerves fine, ± 12–18 on either side. Panicles terminal and axillary, well branched, 15–40(–60) cm. long, shortly brownish hairy; bracts linear-lanceolate, 2–3 mm. long, caducous; bracteoles inserted on very short pedicel, similar to bract. Calyx shortly toothed, 4–5 mm. long, purplish. Corolla 12–15 mm. long, pinkish to purplish-red; standard suborbicular, glabrous; wings as long as the keel. Fruit broadly ovoid or ellipsoid, slightly keeled, supported on a short thick stipe, 3.2–7.5 cm. long, rugulose, glabrous. Seed ellipsoid, slightly pointed at either end and with a small protuberance just below the hilum, ± 2.5 cm. long; testa delicate, wrinkled. Nativa en Colombia; Alt. 0 - 2000 m.; Amazonia, Andes, Llanura del Caribe, Orinoquia, Pacífico, Valle del Cauca, Valle del Magdalena. Belize, Bolivia, Brazil North, Brazil Northeast, Brazil Southeast, Brazil West-Central, Burkina, Cameroon, Central African Repu, Colombia, Costa Rica, Cuba, Dominican Republic, Ecuador, El Salvador, Equatorial Guinea, Florida, French Guiana, Gabon, Gambia, Guatemala, Guinea-Bissau, Gulf of Guinea Is., Guyana, Haiti, Honduras, Ivory Coast, Jamaica, Leeward Is., Mali, Mexico Gulf, Mexico Northeast, Mexico Northwest, Mexico Southeast, Mexico Southwest, Nicaragua, Nigeria, Panamá, Peru, Puerto Rico, Senegal, Suriname, Trinidad-Tobago, Venezuela, Windward Is. Andira inermis subsp. glabricalyx R.T.Penn. Andira grandiflora Guill. & Perr. 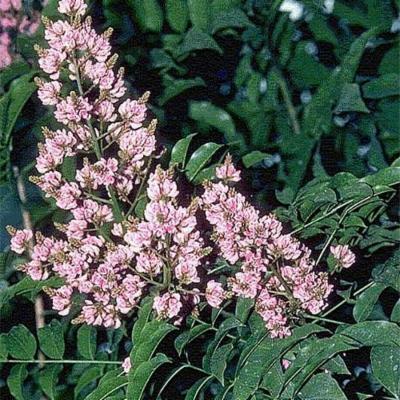 Andira inermis var. riedelii Benth. van der Maesen, L.J.G. & Sosef, M.S.M. (2016). Flore du Gabon 49: 1-407. Muséum National d'Histoire Naturelle, Paris. Aubrév. Fl. For. Soud.-Guin. 318, t. 47, 3–7. Fawcett & Rendle, Fl. Jamaica 4 (2): 84 (1920). Benth. in Mart., Fl. Bras. 15 (1): 298, t. 116 (1862). DC., Prodr. 2: 475 (1825). Pennington, R. T. (1994). Taxonomy & Molecular Syst. of Andira. Unpublished D. Phil. Lock, J. M. (1989). Legumes of Africa:a check-list. RBG Kew. Smith, A. C. (1985). Flora Vitiensis Nova, Vol. 3. Pio Correa, M. (1931). 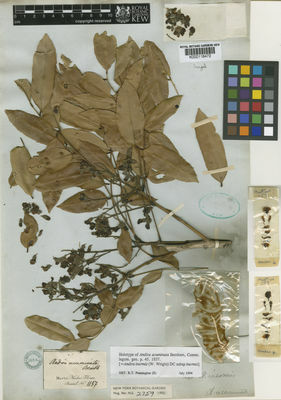 Dictionario das plantas Uteis do Brasil. 6v.